Public Lectures and Discussions “Big Data, New Media, Documentation Issues-Learning from Pioneering Initiatives"
The lectures will interest students, researchers, scientists across disciplines, representatives of the public and private sectors, and anyone engaged in the transformation of big data into valuable documentation. 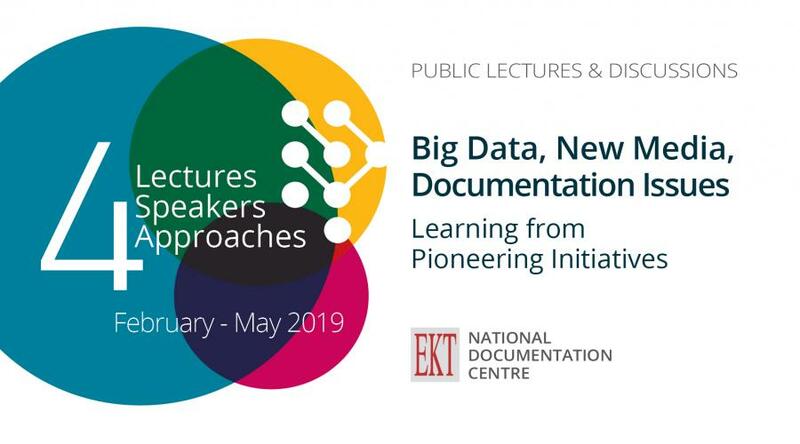 A new series of public Lectures-Discussions “Big Data, New Media, Documentation Issues: Learning from Pioneering Initiatives”, starts on 6th February and ends on 8th May, at the National Hellenic Research Foundation. The lecture series is being organised by the Scientific Council of the National Documentation Centre (ΕΚΤ) with the support of Interdepartmental Graduate Program “Science, technology, Society—Science and Technology Studies” National and Kapodistrian University of Athens and aims to inform the public about the connection between big data, new media and documentation. Every day, a huge volume of data is generated and accumulated by organisations, businesses, research institutions and universities. The transformation of this Big Data into useful and valid documentation occupies a central role in today's Knowledge Society. The National Documentation Centre (EKT) is the institutional body responsible for monitoring and supporting this transformation, advancing dissemination and facilitating exploitation of results which develop the economy and solve major social problems. The creation of Big Data is a natural consequence of the rapid development and use of Internet and New Media, something unprecedented in human history. It is therefore essential that modern societies effectively tackle the issue of making the proper use of this data. During 4 two-hour lecture- discussions, four distinguished speakers with backgrounds in the Humanities, Social Sciences and Natural Sciences, will share their own viewpoint on the topic. These speakers have extensive experience in the management and documentation of big data and have been selected based on their leading role in pioneering related ventures. The first lecture is on 6 February 2019 (18.00-20.00), in the L. Zervas amphitheatre NHRF and is in English. It will be given by Andreas Fickers, Professor for Contemporary and Digital History, Director of the Luxembourg Centre for Contemporary and Digital History (C²DH), Head of the Digital History Laboratory. On 20 March 2019 (18.00-20.00), the session will be in Greek and presented by Christos Arvanitidis Head of Research, Institute of Marine Biology, Biotechnology and Aquaculture, Hellenic Centre for Marine Research (HCMR). On 10 April 2019 (18.00-20.00), the lecture will be given in English by Jürgen Neyer, Professor and Vice-President of International Affairs, Director of the Centre for the Internet and Human Rights (CIHR), European University Viadrina. The final lecture is on 8 May 2019 (18.00-20.00) and will be given in English by William Allen, Fellow by Examination in Political and Development Studies, Madgalen College, University of Oxford, Research Officer, Centre on Migration, Policy, and Society (COMPAS). The lectures will interest students, researchers, scientists across disciplines, representatives of the public and private sectors, and anyone engaged in the transformation of big data into valuable documentation. Each lecture will be followed by open discussion with the audience. Attendance is free of charge (no registration is required).